Individuals expressing the genetic mutation at the dystrophin gene exhibit significantly diminished amounts of dystrophin in skeletal muscle, which has been shown to be absent or greatly deficient (less than 3% of normal amounts) in patients with DMD.7 Dystrophic muscles also display greatly reduced amounts of other DPC glycoproteins associated with the cell membrane.11 Research has illustrated that this deficiency leads to widespread consequences affecting multiple cellular processes ultimately leading to muscle cell membrane breakdown, apoptosis and necrosis. When deciding what animal model is the best option in DMD research many criteria need to be considered. These conditions include: the genetic basis of the disease should be the same for both humans and the animal model; the model should demonstrate key hallmarks of the disease, DMD; the animals should be readily available, easy to handle and maintainable in standard laboratory conditions; disease progression should be well characterized and documented; and the phenotype should be reproducible.12 Based on these conditions, the feline and non-mammalian models are not yet characterized or well documented and the pathology differs to a large degree from humans.12 Therefore, the mdx mouse and GRMD dog are currently the best option for animal models in DMD research. Although the GRMD model is the closest model of the human disease, it is an expensive model to maintain. The mdx mouse has the advantages of being small, reproducible, commercially available, inexpensive, and well researched. 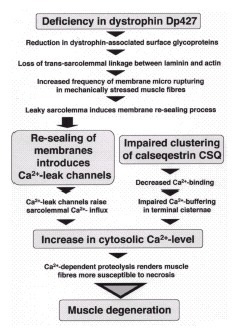 Regardless of the mechanism, increased permeability of the cell membrane allows efflux of intracellular creatine kinase (CK) into the serum along with an influx of extra-cellular calcium.34 36 Persistent inflammation in combination with poor regeneration causes the progressive muscular degeneration characteristic of DMD. The inflammatory process in DMD is not fully understood as there are a number of possible locations for abnormal cellular communication or function. The following is a list of some of the cellular agents present in the complex inflammatory cascade of DMD. People with DMD have been found to have low bone mineral density (BMD) even in the absence of steroid therapy.85 Some proposed mechanisms for decreased BMD in this population are low muscle mass, reduced mechanical loading, narrow bones, short stature as well as glucocorticoid treatment.2 In DMD, it is proposed that the bones are not subject to the same weight bearing and mechanical loading as in the typical population.2 85 Mechanical stress on the bone is an important determinant of BMD and bone strength. Osteocytes respond to changes in mechanical loading and bone metabolism.86 In healthy individuals, mechanical loading of the bone induces osteocyte signaling through the gap junction, initiating osteoblastic bone formation and/or inhibiting osteoclastic resorption.86 In people with DMD, especially those who become non-ambulatory, mechanical stresses on the bone differ from that of healthy individuals. Aartsma-Rus et al.124 conducted a study that included six patients with DMD who were affected by different mutations on different exons. Each of the six DMD patients had myotube cultures that were transfected with the AON specific for skipping the mutated exon. All six of the patient’s culture showed exon skipping and resulted in shorter remaining proteins. Dystrophin was detected, as soon as 16 hours after the transfection, in 75%-80% of the cultures and the reading frames were restored in the treated cells through exon skipping and resulted in dystrophins similar to BMD.124 These proteins are most likely more functional. The formation of the dystrophin-glycoprotein complex was also re-established following the restoration of dystrophin synthesis.124 This study demonstrates a successful therapeutic approach to minimize the severity of DMD in over 75% of the mutations reported in DMD by taking into account different deletions and mutations. The following year, a similar study121 was conducted to determine the effectiveness of inducing skipping of multiple exons to create deletions. The researchers found the approach to be very challenging from a technical standpoint as there is great variability and the levels of intended multiexon skips are usually low.121 It is also important to look at the condition of the muscle tissue following an AON treatment. It has been shown that dystrophin transcripts are targeted in the exon skipping approach, but the transcripts are only expressed in muscle tissue. As DMD progresses, fibrotic and adipose tissue replace the muscle so AON treatment should begin in the earliest of stages to maximize the clinical outcome.125 Exon skipping using AONs has proven to be successful in animal and human models, but further research is warranted to determine any negative side effects associated with the gene therapy and continue the scientific search for the DMD cure. Adeno-associated virus (AAV) is a small virus that infects humans causing a mild immune response. Its properties have made it successful in gene therapy as the delivering agent into the cells without eliciting infectious diseases in humans.126 The AAV vector can package the dystrophin in smaller forms while preserving the signaling and structural support. The mdx mouse model has been successful in reversing the dystrophic phenotype127 but further research is warranted to determine the effects this therapy has in humans. Human have multiple muscle groups affected by MD making the vector delivery significantly more challenging. Advances in this type of gene therapy are underway with the possibility of systemic delivery in humans in the future.126 It is very important to consider the body’s immune system response to AAV. Mendell et al.,128 found that in human muscle, transgene expression was successful after viral vector mediated gene delivery and lasted for up to 3 months.128 In this study of three people with MD, only one experienced a cytotoxic T-cell response at a minimal level that did not prevent the resulting gene expression.128 Further research needs to be completed to ensure eradication of a T-cell mediated response with adeno-associated virus-mediated gene therapy. Duchenne muscular dystrophy (DMD) is an inherited X-linked recessive disorder affecting male births resulting in progressive muscle weakness and wasting.1 Dystrophin, a cellular protein, is absent in the disease that leads to loss of contractile function of skeletal muscle.1 2 3 4 There have been many studies on human and animal models trying to determine which cellular mechanism to alter in the hopes of finding a treatment. It is evident that there are many cellular mechanisms involved in the disease process of DMD. Inflammation sets off a cascade leading to the production of free radicals and eventually apoptosis. The cellular cascade affects many body systems including the musculoskeletal system, cardiovascular system, respiratory system, and immune system. Current medical management includes the use of corticosteroids in attempt to slow the progression of the disease and gene therapy with the hope of altering the disease to a milder form. Unfortunately, despite the ongoing research related to DMD, there is no known treatment or cure. More research needs to be conducted to determine a definitive cure for this devastating disorder. 1. Grange RW, Call JA. Recommendations to define exercise prescription for Duchenne muscular dystrophy. Exercise And Sport Sciences Reviews. 2007;35(1):12-17. 2. Söderpalm A-C, Magnusson P, Ahlander A-C, et al. Low bone mineral density and decreased bone turnover in Duchenne muscular dystrophy. Neuromuscular Disorders: NMD. 2007;17(11-12):919-928. 3. Bianchi ML, Mazzanti A, Galbiati E, et al. Bone mineral density and bone metabolism in Duchenne muscular dystrophy. Osteoporosis International: A Journal Established As Result Of Cooperation Between The European Foundation For Osteoporosis And The National Osteoporosis Foundation Of The USA. 2003;14(9):761-767. 4. Verma S, Anziska Y, Cracco J. Review of Duchenne muscular dystrophy (DMD) for the pediatricians in the community. Clinical Pediatrics. 2010;49(11):1011-1017. 5. Dooley J, Gordon KE, Dodds L, MacSween J. Duchenne muscular dystrophy: a 30-year population-based incidence study. Clinical Pediatrics. 2010;49(2):177-179. 6. Helderman-van den Enden ATJM, Straathof CSM, Aartsma-Rus A, et al. Becker muscular dystrophy patients with deletions around exon 51; a promising outlook for exon skipping therapy in Duchenne patients. Neuromuscular Disorders: NMD. 2010;20(4):251-254. 7. McArdle A, Edwards RH, Jackson MJ. How does dystrophin deficiency lead to muscle degeneration?—evidence from the mdx mouse. Neuromuscular Disorders: NMD. 1995;5(6):445-456. 8. Whitehead NP, Yeung EW, Allen DG. Muscle damage in mdx (dystrophic) mice: role of calcium and reactive oxygen species. Clinical And Experimental Pharmacology & Physiology. 2006;33(7):657-662. 9. Tidball JG, Wehling-Henricks M. The role of free radicals in the pathophysiology of muscular dystrophy. Journal Of Applied Physiology (Bethesda, Md. : 1985). 2007;102(4):1677-1686. 10. Menazza S, Blaauw B, Tiepolo T, et al. Oxidative stress by monoamine oxidases is causally involved in myofiber damage in muscular dystrophy. Human Molecular Genetics. 2010;19(21):4207-4215. 11. Ohlendieck K, Campbell KP. Dystrophin-associated proteins are greatly reduced in skeletal muscle from mdx mice. The Journal Of Cell Biology. 1991;115(6):1685-1694. 12. Willmann R, Possekel S, Dubach-Powell J, Meier T, Ruegg MA. Mammalian animal models for Duchenne muscular dystrophy. Neuromuscular Disorders: NMD. 2009;19(4):241-249. 13. Collins CA, Morgan JE. Duchenne's muscular dystrophy: animal models used to investigate pathogenesis and develop therapeutic strategies. International Journal Of Experimental Pathology. 2003;84(4):165-172. 15. Bulfield G, Siller WG, Wight PA, Moore KJ. X chromosome-linked muscular dystrophy (mdx) in the mouse. Proceedings Of The National Academy Of Sciences Of The United States Of America. 1984;81(4):1189-1192. 16. Hoffman EP, Brown RH, Jr., Kunkel LM. Dystrophin: the protein product of the Duchenne muscular dystrophy locus. Cell. 1987;51(6):919-928. 17. McGeachie JK, Grounds MD, Partridge TA, Morgan JE. Age-related changes in replication of myogenic cells in mdx mice: quantitative autoradiographic studies. Journal of the neurological sciences. 1993;119(2):169-179. 18. Stedman HH, Sweeney HL, Shrager JB, et al. 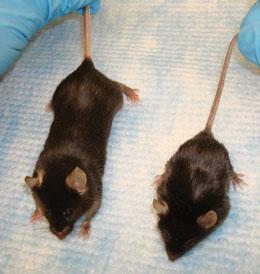 The mdx mouse diaphragm reproduces the degenerative changes of Duchenne muscular dystrophy. Nature. 1991;352(6335):536-539. 19. Gayraud J, Matecki S, Hnia K, et al. Ventilation during air breathing and in response to hypercapnia in 5 and 16 month-old mdx and C57 mice. Journal Of Muscle Research And Cell Motility. 2007;28(1):29-37. 20. Quinlan JG, Hahn HS, Wong BL, Lorenz JN, Wenisch AS, Levin LS. Evolution of the mdx mouse cardiomyopathy: physiological and morphological findings. Neuromuscular Disorders: NMD. 2004;14(8-9):491-496. 21. Sharp NJ, Kornegay JN, Van Camp SD, et al. An error in dystrophin mRNA processing in golden retriever muscular dystrophy, an animal homologue of Duchenne muscular dystrophy. Genomics. 1992;13(1):115-121. 22. Cooper BJ, Winand NJ, Stedman H, et al. The homologue of the Duchenne locus is defective in X-linked muscular dystrophy of dogs. Nature. 1988;334(6178):154-156. 23. Schatzberg SJ, Olby NJ, Breen M, et al. Molecular analysis of a spontaneous dystrophin 'knockout' dog. Neuromuscular Disorders: NMD. 1999;9(5):289-295. 24. Shimatsu Y, Katagiri K, Furuta T, et al. Canine X-linked muscular dystrophy in Japan (CXMDJ). Experimental Animals / Japanese Association For Laboratory Animal Science. 2003;52(2):93-97. 25. Valentine BA, Cooper BJ, de Lahunta A, O'Quinn R, Blue JT. Canine X-linked muscular dystrophy. An animal model of Duchenne muscular dystrophy: clinical studies. Journal of the neurological sciences. 1988;88(1-3):69-81. 26. Winand NJ, Edwards M, Pradhan D, Berian CA, Cooper BJ. Deletion of the dystrophin muscle promoter in feline muscular dystrophy. Neuromuscular Disorders: NMD. 1994;4(5-6):433-445. 27. Gaschen FP, Hoffman EP, Gorospe JR, et al. Dystrophin deficiency causes lethal muscle hypertrophy in cats. Journal of the neurological sciences. 1992;110(1-2):149-159. 28. Rubinstein AL. Zebrafish: from disease modeling to drug discovery. Current Opinion In Drug Discovery & Development. 2003;6(2):218-223. 29. Baumeister R GL. The worm in us- Caenorhabtitis elegans as as model of human disease. Trends in Biotechnology. 2002;20:147-148. 30. Chambers SP, Dodd A, Overall R, et al. Dystrophin in adult zebrafish muscle. Biochemical And Biophysical Research Communications. 2001;286(3):478-483. 31. Abdel-Salam E, Abdel-Meguid I, Korraa SS. Markers of degeneration and regeneration in Duchenne muscular dystrophy. Acta Myologica: Myopathies And Cardiomyopathies: Official Journal Of The Mediterranean Society Of Myology / Edited By The Gaetano Conte Academy For The Study Of Striated Muscle Diseases. 2009;28(3):94-100. 32. Ichim TE, Alexandrescu DT, Solano F, et al. Mesenchymal stem cells as anti-inflammatories: implications for treatment of Duchenne muscular dystrophy. Cellular Immunology. 2010;260(2):75-82. 33. Y.W. Chen KN, M. Bakay, O. McIntyre, R. Rawat, R. Shi, and E. P. Hoffman. Early onset of inflammation and later involvement of TGFB in Duchenne muscular dystrophy. Neurology. 2005;65:826-834. 34. Arahata K. Muscular Dystrophy. Neuropathology And Applied Neurobiology. 2000;2:S34-S41. 35. Ozawa E, Hagiwara Y, Yoshida M. Creatine kinase, cell membrane and Duchenne muscular dystrophy. Molecular And Cellular Biochemistry. 1999;190(1-2):143-151. 36. Sussman M. Duchenne muscular dystrophy. The Journal Of The American Academy Of Orthopaedic Surgeons. 2002;10(2):138-151. 37. Tidball JG, Wehling-Henricks M. Damage and inflammation in muscular dystrophy: potential implications and relationships with autoimmune myositis. Current Opinion In Rheumatology. 2005;17(6):707-713. 38. Gosselin LE, McCormick KM. Targeting the immune system to improve ventilatory function in muscular dystrophy. Medicine and Science in Sports and Exercise. 2004;36(1):44-51. 39. Acharyya S, Villalta SA, Bakkar N, et al. Interplay of IKK/NF-kappaB signaling in macrophages and myofibers promotes muscle degeneration in Duchenne muscular dystrophy. The Journal Of Clinical Investigation. 2007;117(4):889-901. 40. Shankarkumar U. The Human Leukocyte Antigen (HLA) System Int J Hum Genet. 2004;4(2):91-103. 41. Chang WJ, Iannaccone ST, Lau KS, et al. Neuronal nitric oxide synthase and dystrophin-deficient muscular dystrophy. Proceedings Of The National Academy Of Sciences Of The United States Of America. 1996;93(17):9142-9147. 42. Niebroj-Dobosz I aH-PI. The involvement of oxidative stress in determining the severity and progress of pathologicalprocesses in dystrophin-deficient muscles. Acta Biochimica Polonica. 2005;52(2):449-452. 43. Disatnik MH, Chamberlain JS, Rando TA. Dystrophin mutations predict cellular susceptibility to oxidative stress. Muscle & Nerve. 2000;23(5):784-792. 44. Shiao T, Fond A, Deng B, et al. Defects in neuromuscular junction structure in dystrophic muscle are corrected by expression of a NOS transgene in dystrophin-deficient muscles, but not in muscles lacking alpha- and beta1-syntrophins. Human Molecular Genetics. 2004;13(17):1873-1884. 45. Lawler JM SW, and Demaree SR. Hindlimb unloading increases oxidative stress and disrupts antioxidant capacity in skeletal muscle. Free Radic Biol Med. 2003;35:9-16. 46. Williams IA, Allen DG. The role of reactive oxygen species in the hearts of dystrophin-deficient mdx mice. American Journal Of Physiology. Heart And Circulatory Physiology. 2007;293(3):H1969-H1977. 47. Turner PR, Fong PY, Denetclaw WF, Steinhardt RA. Increased calcium influx in dystrophic muscle. The Journal Of Cell Biology. 1991;115(6):1701-1712. 48. Robert V, Massimino ML, Tosello V, et al. Alteration in calcium handling at the subcellular level in mdx myotubes. The Journal Of Biological Chemistry. 2001;276(7):4647-4651. 49. Mallouk N JV, and Allard B. Elevated subsarcolemmal Ca2+ in mdxmouse skeletal muscle fibers detected with Ca2+ -activated K+ channels. Proc Natl Acad Sci USA. 2000;97:4950-4955. 50. Kuznetsov AV, Winkler K, Wiedemann FR, von Bossanyi P, Dietzmann K, Kunz WS. Impaired mitochondrial oxidative phosphorylation in skeletal muscle of the dystrophin-deficient mdx mouse. Molecular And Cellular Biochemistry. 1998;183(1-2):87-96. 51. Wallace DC. The mitochondrial genome in human adaptive radiation and disease: on the road to therapeutics and performance enhancement. Gene. 2005;354:169-180. 52. Millay DP, Sargent MA, Osinska H, et al. Genetic and pharmacologic inhibition of mitochondrial-dependent necrosis attenuates muscular dystrophy. Nature Medicine. 2008;14(4):442-447. 53. Palma E, Tiepolo T, Angelin A, et al. Genetic ablation of cyclophilin D rescues mitochondrial defects and prevents muscle apoptosis in collagen VI myopathic mice. Human Molecular Genetics. 2009;18(11):2024-2031. 54. Kumar A aBA. Mechanical stress activates the nuclear factor-kappaβ pathway in skeletal muscle fibers: a possible role in Duchenne muscular dystrophy. FASEB J. 2003;17(386-396). 55. Wehling M, Spencer MJ, Tidball JG. A nitric oxide synthase transgene ameliorates muscular dystrophy in mdx mice. The Journal Of Cell Biology. 2001;155(1):123-131. 56. Sandri M, El Meslemani AH, Sandri C, et al. Caspase 3 expression correlates with skeletal muscle apoptosis in Duchenne and facioscapulo human muscular dystrophy. A potential target for pharmacological treatment? Journal Of Neuropathology And Experimental Neurology. 2001;60(3):302-312. 57. Danielsson O, Nilsson C, Lindvall B, Ernerudh J. Expression of apoptosis related proteins in normal and diseased muscle: a possible role for Bcl-2 in protection of striated muscle. Neuromuscular Disorders: NMD. 2009;19(6):412-417. 58. Miller JB, Girgenrath M. The role of apoptosis in neuromuscular diseases and prospects for anti-apoptosis therapy. Trends In Molecular Medicine. 2006;12(6):279-286. 59. Sandri M, Podhorska-Okolow M, Geromel V, et al. Exercise induces myonuclear ubiquitination and apoptosis in dystrophin-deficient muscle of mice. Journal Of Neuropathology And Experimental Neurology. 1997;56(1):45-57. 60. Sandri M, Carraro U. Apoptosis of skeletal muscles during development and disease. The International Journal Of Biochemistry & Cell Biology. 1999;31(12):1373-1390. 61. Tidball JG, Albrecht DE, Lokensgard BE, Spencer MJ. 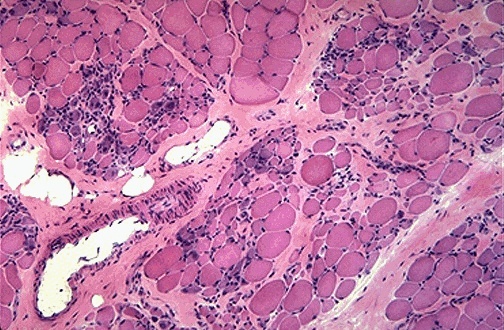 Apoptosis precedes necrosis of dystrophin-deficient muscle. Journal Of Cell Science. 1995;108 ( Pt 6):2197-2204. 62. Tews DS. Apoptosis and muscle fibre loss in neuromuscular disorders. Neuromuscular Disorders: NMD. 2002;12(7-8):613-622. 63. Sandri M, Minetti C, Pedemonte M, Carraro U. Apoptotic myonuclei in human Duchenne muscular dystrophy. Laboratory Investigation; A Journal Of Technical Methods And Pathology. 1998;78(8):1005-1016. 64. Carpenter GKaS. The deficiency of a sarcolemmal cytoskeletal protein (dystrophin) leads to the necrosis of skeletal muscle fibres in Duchenne-Becker dystrophy. Neuro Junc. 1988:429-436. 65. Head SI, Williams DA, Stephenson DG. Abnormalities in structure and function of limb skeletal muscle fibres of dystrophic mdx mice. Proceedings. Biological Sciences / The Royal Society. 1992;248(1322):163-169. 66. Petrof BJ, Shrager JB, Stedman HH, Kelly AM, Sweeney HL. Dystrophin protects the sarcolemma from stresses developed during muscle contraction. Proceedings Of The National Academy Of Sciences Of The United States Of America. 1993;90(8):3710-3714. 67. Clarke MS, Khakee R, McNeil PL. Loss of cytoplasmic basic fibroblast growth factor from physiologically wounded myofibers of normal and dystrophic muscle. Journal Of Cell Science. 1993;106 ( Pt 1):121-133. 68. Moens P, Baatsen PH, Maréchal G. Increased susceptibility of EDL muscles from mdx mice to damage induced by contractions with stretch. Journal Of Muscle Research And Cell Motility. 1993;14(4):446-451. 69. McArdle A, Edwards RH, Jackson MJ. Time course of changes in plasma membrane permeability in the dystrophin-deficient mdx mouse. Muscle & Nerve. 1994;17(12):1378-1384. 70. Frascarelli M, Rocchi L, Feola I. EMG computerized analysis of localized fatigue in Duchenne muscular dystrophy. Muscle & Nerve. 1988;11(7):757-761. 71. Mohr S, Hallak H, de Boitte A, Lapetina EG, Brüne B. Nitric oxide-induced S-glutathionylation and inactivation of glyceraldehyde-3-phosphate dehydrogenase. The Journal Of Biological Chemistry. 1999;274(14):9427-9430. 72. Souza JM, Radi R. Glyceraldehyde-3-phosphate dehydrogenase inactivation by peroxynitrite. Archives Of Biochemistry And Biophysics. 1998;360(2):187-194. 73. Rowland LP. Biochemistry of muscle membranes in Duchenne muscular dystrophy. Muscle & Nerve. 1980;3(1):3-20. 74. Gorospe EPHaJRM. The animal models of Duchenne muscular dystrophy: windows on the pathophysiological consequences of dystrophin deficiency. Ordering the membrane cytoskeleton trilayer. 1991:113-154. 75. Hutter OF. The membrane hypothesis of Duchenne muscular dystrophy: quest for functional evidence. Journal Of Inherited Metabolic Disease. 1992;15(4):565-577. 76. Gurusinghe AD, Wilce MC, Austin L, Hearn MT. Duchenne muscular dystrophy and dystrophin: sequence homology observations. Neurochemical Research. 1991;16(6):681-686. 77. Zaidi SI, Narahara HT. Degradation of skeletal muscle plasma membrane proteins by calpain. The Journal Of Membrane Biology. 1989;110(3):209-216. 78. Goll DE, Thompson VF, Li H, Wei W, Cong J. The calpain system. Physiological Reviews. 2003;83(3):731-801. 79. Spencer MJ, Croall DE, Tidball JG. Calpains are activated in necrotic fibers from mdx dystrophic mice. The Journal Of Biological Chemistry. 1995;270(18):10909-10914. 80. Bonuccelli G, Sotgia F, Schubert W, et al. Proteasome inhibitor (MG-132) treatment of mdx mice rescues the expression and membrane localization of dystrophin and dystrophin-associated proteins. The American Journal Of Pathology. 2003;163(4):1663-1675. 81. Spencer MJ, Mellgren RL. Overexpression of a calpastatin transgene in mdx muscle reduces dystrophic pathology. Human Molecular Genetics. 2002;11(21):2645-2655. 82. Anderson JE. A role for nitric oxide in muscle repair: nitric oxide-mediated activation of muscle satellite cells. Molecular Biology Of The Cell. 2000;11(5):1859-1874. 83. Rando TA. Role of nitric oxide in the pathogenesis of musculardystropies: a “two hit” hypothesis of the cause of muscle necrosis. Micosc Res Tech. 2001;55:223-235. 84. Dudley RWR, Danialou G, Govindaraju K, Lands L, Eidelman DE, Petrof BJ. Sarcolemmal damage in dystrophin deficiency is modulated by synergistic interactions between mechanical and oxidative/nitrosative stresses. The American Journal Of Pathology. 2006;168(4):1276. 85. Larson CM, Henderson RC. Bone mineral density and fractures in boys with Duchenne muscular dystrophy. Journal Of Pediatric Orthopedics. 2000;20(1):71-74. 86. Eriksen EF. Cellular mechanisms of bone remodeling. Reviews In Endocrine & Metabolic Disorders. 2010;11(4):219-227. 87. Arun R, Srinivas S, Mehdian SMH. Scoliosis in Duchenne's muscular dystrophy: a changing trend in surgical management : a historical surgical outcome study comparing sublaminar, hybrid and pedicle screw instrumentation systems. European Spine Journal: Official Publication Of The European Spine Society, The European Spinal Deformity Society, And The European Section Of The Cervical Spine Research Society. 2010;19(3):376-383. 88. McNally EM. 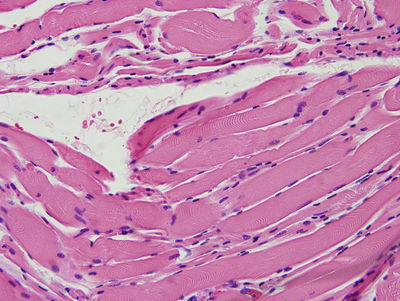 New approaches in the therapy of cardiomyopathy in muscular dystrophy. Annual Review Of Medicine. 2007;58:75-88. 89. Kaspar RW, Allen HD, Montanaro F. Current understanding and management of dilated cardiomyopathy in Duchenne and Becker muscular dystrophy. Journal Of The American Academy Of Nurse Practitioners. 2009;21(5):241-249. 90. Manzur AY, Kinali M, Muntoni F. Update on the management of Duchenne muscular dystrophy. Archives Of Disease In Childhood. 2008;93(11):986-990. 91. Corrado G, Lissoni A, Beretta S, et al. Prognostic value of electrocardiograms, ventricular late potentials, ventricular arrhythmias, and left ventricular systolic dysfunction in patients with Duchenne muscular dystrophy. The American Journal Of Cardiology. 2002;89(7):838-841. 92. Burelle Y, Khairallah M, Ascah A, et al. Alterations in mitochondrial function as a harbinger of cardiomyopathy: lessons from the dystrophic heart. Journal Of Molecular And Cellular Cardiology. 2010;48(2):310-321. 93. Fayssoil A, Nardi O, Orlikowski D, Annane D. Cardiomyopathy in Duchenne muscular dystrophy: pathogenesis and therapeutics. Heart Failure Reviews. 2010;15(1):103-107. 94. Sander M, Chavoshan B, Harris SA, et al. Functional muscle ischemia in neuronal nitric oxide synthase-deficient skeletal muscle of children with Duchenne muscular dystrophy. Proceedings Of The National Academy Of Sciences Of The United States Of America. 2000;97(25):13818-13823. 95. Crosbie RH. NO vascular control in Duchenne muscular dystrophy. Nature Medicine. 2001;7(1):27-29. 96. Brenman JE, Chao DS, Xia H, Aldape K, Bredt DS. Nitric oxide synthase complexed with dystrophin and absent from skeletal muscle sarcolemma in Duchenne muscular dystrophy. Cell. 1995;82(5):743-752. 97. Percival JM, Anderson KNE, Gregorevic P, Chamberlain JS, Froehner SC. Functional deficits in nNOSmu-deficient skeletal muscle: myopathy in nNOS knockout mice. Plos One. 2008;3(10):e3387-e3387. 98. Petrof BJ. The molecular basis of activity-induced muscle injury in Duchenne muscular dystrophy. Molecular And Cellular Biochemistry. 1998;179(1-2):111-123. 99. Toussaint M, Chatwin M, Soudon P. Mechanical ventilation in Duchenne patients with chronic respiratory insufficiency: clinical implications of 20 years published experience. Chronic Respiratory Disease. 2007;4(3):167-177. 100. Lo Mauro A, D'Angelo MG, Romei M, et al. Abdominal volume contribution to tidal volume as an early indicator of respiratory impairment in Duchenne muscular dystrophy. The European Respiratory Journal: Official Journal Of The European Society For Clinical Respiratory Physiology. 2010;35(5):1118-1125. 101. Tangsrud S, Petersen IL, Lødrup Carlsen KC, Carlsen KH. Lung function in children with Duchenne's muscular dystrophy. Respiratory Medicine. 2001;95(11):898-903. 102. Wehling-Henricks M, Sokolow S, Lee JJ, Myung KH, Villalta SA, Tidball JG. Major basic protein-1 promotes fibrosis of dystrophic muscle and attenuates the cellular immune response in muscular dystrophy. Human Molecular Genetics. 2008;17(15):2280-2292. 103. Evans NP, Misyak SA, Robertson JL, Bassaganya-Riera J, Grange RW. Immune-mediated mechanisms potentially regulate the disease time-course of duchenne muscular dystrophy and provide targets for therapeutic intervention. PM & R: The Journal Of Injury, Function, And Rehabilitation. 2009;1(8):755-768. 104. Farini A, Meregalli M, Belicchi M, et al. T and B lymphocyte depletion has a marked effect on the fibrosis of dystrophic skeletal muscles in the scid/mdx mouse. The Journal Of Pathology. 2007;213(2):229-238. 105. Hussein MRA, Abu-Dief EE, Kamel NF, Mostafa MG. Steroid therapy is associated with decreased numbers of dendritic cells and fibroblasts, and increased numbers of satellite cells, in the dystrophic skeletal muscle. Journal Of Clinical Pathology. 2010;63(9):805-813. 106. Wong BLY, Christopher C. Corticosteroids in Duchenne muscular dystrophy: a reappraisal. Journal Of Child Neurology. 2002;17(3):183-190. 107. Baltgalvis KA, Call JA, Nikas JB, Lowe DA. Effects of prednisolone on skeletal muscle contractility in mdx mice. Muscle & Nerve. 2009;40(3):443-454. 108. Manzur AY, Kuntzer T, Pike M, Swan A. Glucocorticoid corticosteroids for Duchenne muscular dystrophy. Cochrane Database Of Systematic Reviews (Online). 2008(1):CD003725. 109. Angelini C. The role of corticosteroids in muscular dystrophy: a critical appraisal. Muscle & Nerve. 2007;36(4):424-435. 110. Fisher I, Abraham D, Bouri K, Hoffman EP, Muntoni F, Morgan J. Prednisolone-induced changes in dystrophic skeletal muscle. The FASEB Journal: Official Publication Of The Federation Of American Societies For Experimental Biology. 2005;19(7):834-836. 111. K Bushby RF, DJ Birnkrant, et al. Diagnosis and management of Duchenne muscular dystrophy, part 1: diagnosis, and pharmacological and psychosocial management. Lancet Neurol. 2010;9:77-93. 112. Hirayama T, Sabokbar A, Athanasou NA. Effect of corticosteroids on human osteoclast formation and activity. The Journal Of Endocrinology. 2002;175(1):155-163. 113. Plotkin LI, Manolagas SC, Bellido T. Glucocorticoids induce osteocyte apoptosis by blocking focal adhesion kinase-mediated survival. Evidence for inside-out signaling leading to anoikis. The Journal Of Biological Chemistry. 2007;282(33):24120-24130. 114. RD Howland MM, RA Harvey, PC Champe. Lippincott's Illustrated Reviews: Pharmacology. 3rd ed. Baltimore: Lippincott, Williams & Wilkins 2006. 115. van Deutekom JC, Bremmer-Bout M, Janson AA, et al. Antisense-induced exon skipping restores dystrophin expression in DMD patient derived muscle cells. Human Molecular Genetics. 2001;10(15):1547-1554. 116. van Deutekom JCT, van Ommen G-JB. Advances in Duchenne muscular dystrophy gene therapy. Nature Reviews. Genetics. 2003;4(10):774-783. 117. Parker JN PP, ed Duchenne muscular dystrophy: a medical dictionary, bibliography, and annotated research guide to internet references. San Diego ICON Health Publications; 2004. 118. Muir LA, Chamberlain JS. Emerging strategies for cell and gene therapy of the muscular dystrophies. Expert Reviews In Molecular Medicine. 2009;11:e18-e18. 119. Aartsma-Rus A, Fokkema I, Verschuuren J, et al. Theoretic applicability of antisense-mediated exon skipping for Duchenne muscular dystrophy mutations. Human Mutation. 2009;30(3):293-299. 120. Heemskerk H, de Winter CL, van Ommen G-JB, van Deutekom JCT, Aartsma-Rus A. Development of antisense-mediated exon skipping as a treatment for duchenne muscular dystrophy. Annals Of The New York Academy Of Sciences. 2009;1175:71-79. 121. Aartsma-Rus A, Janson AAM, Kaman WE, et al. Antisense-induced multiexon skipping for Duchenne muscular dystrophy makes more sense. American Journal Of Human Genetics. 2004;74(1):83-92. 122. Aartsma-Rus A, Bremmer-Bout M, Janson AAM, den Dunnen JT, van Ommen G-JB, van Deutekom JCT. Targeted exon skipping as a potential gene correction therapy for Duchenne muscular dystrophy. Neuromuscular Disorders: NMD. 2002;12 Suppl 1:S71-S77. 123. Lu QL, Mann CJ, Lou F, et al. Functional amounts of dystrophin produced by skipping the mutated exon in the mdx dystrophic mouse. Nature Medicine. 2003;9(8):1009-1014. 124. Aartsma-Rus A, Janson AAM, Kaman WE, et al. Therapeutic antisense-induced exon skipping in cultured muscle cells from six different DMD patients. Human Molecular Genetics. 2003;12(8):907-914. 125. van Deutekom JC, et al. Local dystrophin restoration with antisense oligonucleotide PRO051. N Engl J Med. 2007;357:2677-2686. 126. Haidet AM MJ, Kaspar BK. Could gene therapy be the future for muscular dystrophy? Therapy. 2010;7(3):287-290. 127. Wang B, Li J, Xiao X. Adeno-associated virus vector carrying human minidystrophin genes effectively ameliorates muscular dystrophy in mdx mouse model. Proceedings Of The National Academy Of Sciences Of The United States Of America. 2000;97(25):13714-13719. 128. Mendell JR, Rodino-Klapac LR, Rosales-Quintero X, et al. Limb-girdle muscular dystrophy type 2D gene therapy restores alpha-sarcoglycan and associated proteins. Annals Of Neurology. 2009;66(3):290-297. 129. Mendell JR, Campbell K, Rodino-Klapac L, et al. Dystrophin immunity in Duchenne's muscular dystrophy. The New England Journal Of Medicine. 2010;363(15):1429-1437. I think you guys did a great job of presenting the animal models of MD. Also, your figures/pictures add a nice element to the page. The only recommendation I would have at this point is perhaps revisiting a couple of the cellular mechanisms/findings/genes specific to the disease in the conclusion. But nice work!!! Page looks great. ~Nicole V.
Very well put together website. Images are a nice touch to the information being presented. Cellular chart helpful reference in the paper. The conclusion could elaborate more on current state of research and specific areas currently being targeted. Overall, I very well put together Wiki. Good job everyone. I thought this WIKI was well-formatted and had a nice flow. In the immune system table, I was a little confused as to why "cytokines" had a specific row, but "TNF-alpha" and "Interleukins" weren't included in that section. Along with that, the "CD4 and CD8 cells" were in a separate section than "T cells." Perhaps you could clump those together? Just a thought. Great site, guys! The mdx mice image is very effective. I wonder if there are images that demonstrate the degree of muscle wasting compared to 'normal' muscle in humans. I suspect that would be powerful information for your site, as well. I agree that the flow of information is ordered in a logical manner. Excellent job. Excited to see the effects of exercise on DMD. Great job! The beginning looks really good with the inclusion of images… but there's a large body of just text in the middle of the site that's a little bit overwhelming and not as visually pleasing as the other sections. I thought the flow was great and the information looks good. It was interesting to read about naturally occurring MD in dogs and cats… how knew? Nice work! Really great page!! The animal models section was really interesting and well organized. I like that you separated the animal models when describing them. The images look great and are incorporated well into the text. I also thought that the gene therapy section was very interesting. The overview at the beginning of the Cellular Mechanisms section (under Inflammation) sets up the cellular cascade really nicely. You guys did a great job of putting together all of the components of the disease and cellular mechanisms to create a complete picture. I'm not sure what the answer to this would be, but I wonder if the Bone Density portion of the cellular section should be moved up a little or be a separate section under the other body systems (respiratory, immune)? I just feel like the Two Hit Hypothesis would be a great close to that section and the Bone Density seems a bit out of place after that. I'm not sure where else it would be appropriate, and if you put it there for a specific purpose then ignore this! That's just the way it struck me as the reader. This is a very interesting disease, great job explaining all of the components! Great job! You have done a nice job with the organization of the page and the flow makes the presented material easier to read. One of your images (figure 4), seems to be about mdx pathology and may fit better in the section above with the mdx description. It might be nice to have a human pathology figure also. A couple of the other images could be a bit bigger to make them easier to read. Great job overall! I look forward to reading your exercise section! Great job guys. The page was very informative and comprehensive. I liked the use of many pictures and figures throughout the page, and their organization with the text. I also like the immune response table and how all of those cellular components chage with DMD. It made the information easier to understand. Overall a great job! Great images. I think the first image should be relocated to after the intro. It seems out of place at the beginning. Also the animal model section was fantastic but t would be easier to understand after cellular mechanisms.